Last December, River Plate added a new line to its fabulous list of achievements by winning the 59th edition of the Copa Libertadores. The Argentinian club hopes to repeat their feat and offer their fans a fifth Copa Libertadores. The hostilities have already started with the preliminary rounds. Three phases at the end of which only 4 clubs will qualify for the group phase. The teams are divided into 8 groups of 4, with the top two in each group qualifying for the Round of 16, which will be drawn by lot in May 2019. 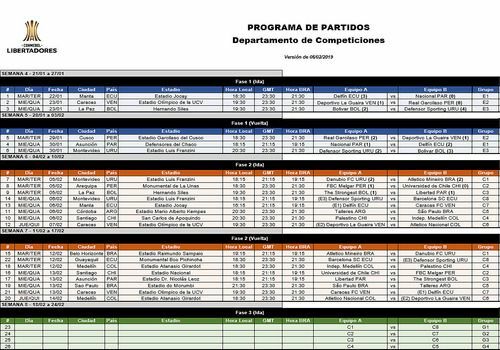 Logitheque will provide you with the match schedule for the Copa Libertadores finals in due course, but you can already download the complete programme listing all the matches in the preliminary rounds and group phase. This document is in PDF format and also displays the list of presenters for each meeting.